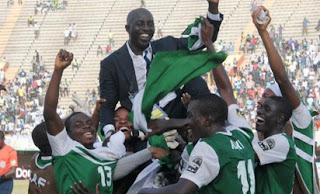 The Nigeria U-23 team has emerged champions of the second edition of the Africa U-23 Cup of Nations following their 2-1 win over their Algerian counterparts on Saturday at the Leopold Sedar Senghor Stadium, Dakar. Two goals from Oghenekaro Etebo in the first half was enough to hand Nigeria the title even though the Algerians got some sort of lifeline when Segun Oduduwa scored an own goal. The Algerians moved closer to getting an equaliser but they were denied by the heroics of goalkeeper Emmanuel Daniel who not only stopped a penalty kick but made other fantastic saves. Nigeria will now head to the Olympics as African Champions and will be joined by the duo of Algeria and South Africa.